Lower Cape Fear Hospice - Donor Recognition Wall - Fused and Hand-Painted Glass (detail). Hospice of the Piedmont (full view) - Donor Recognition Panel - Fused Glass. Fused and hand-painted glass plaque in deep copper color palette. Fused and hand-painted glass plaque in forest color palette. 'Faulkner Institute' - Donor Recognition Wall - Fused and hand-painted glass (close up). Donor Recognition Plaque - Fused and hand-painted glass in rough-hewn bronze and blue color palette. Clear glass sign with painted text and stainless steel hardware. University Medical Center - Donor Recognition Panel - Fused and Hand-Painted Glass. Workspace details - Fused and hand-painted glass. Beacon Place Hospice - Donor Recognition Plaque - Fused and hand-painted glass in gold and black ribbons on blue color palette (quote). Army Distaff Foundation - Donor Recognition Wall - Fused and Hand-Painted Glass. 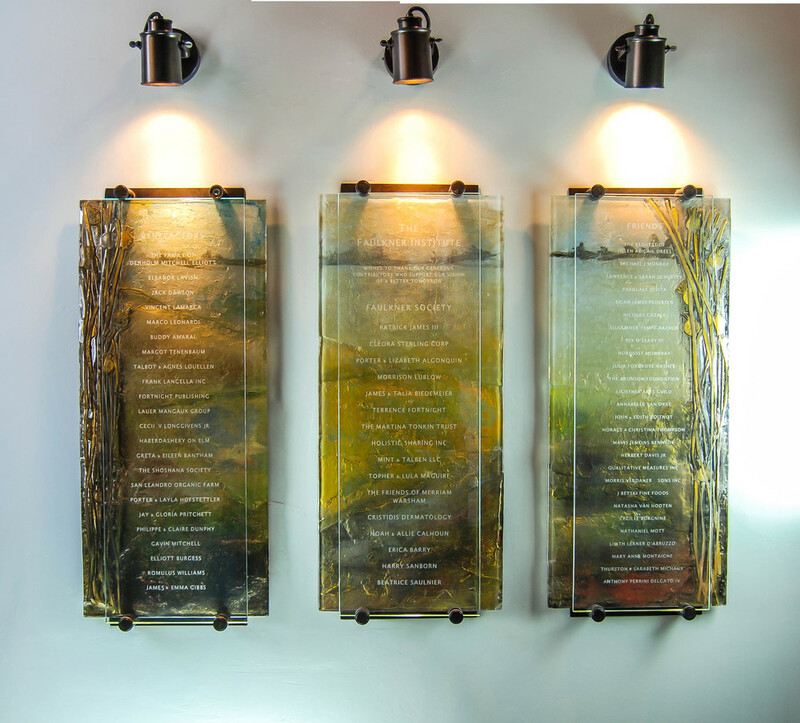 Donor Recognition Plaque - Fused and hand-painted glass 'La Mer' sand and sea color palette. 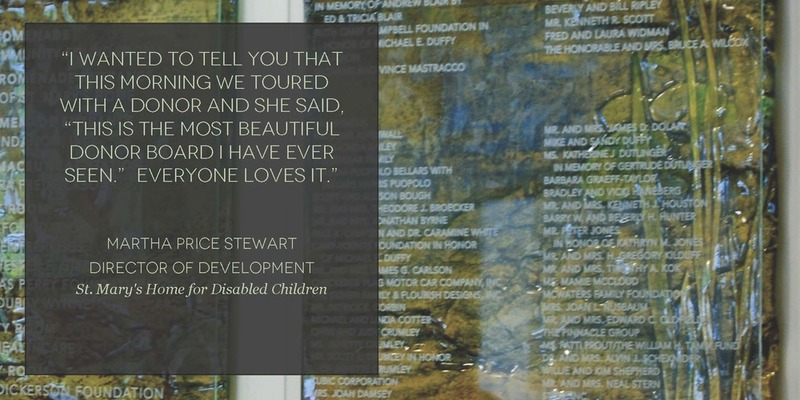 St Mary's Home for Disabled Children - Donor Recognition Wall - Fused and hand-painted glass with lily pond design. Studio workspace - Donor Recognition Plaques - Fused and hand-painted glass. Our donor recognition walls are designed so that names can easily be added, as often as needed. 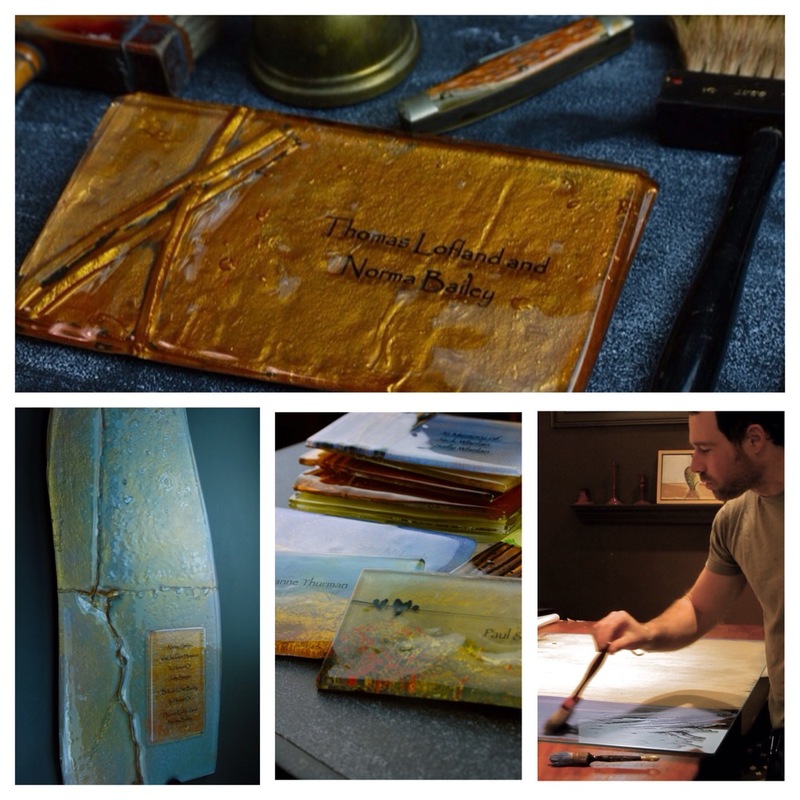 Workspace Details - Donor Recognition Plaques - Fused and hand-painted glass in copper. 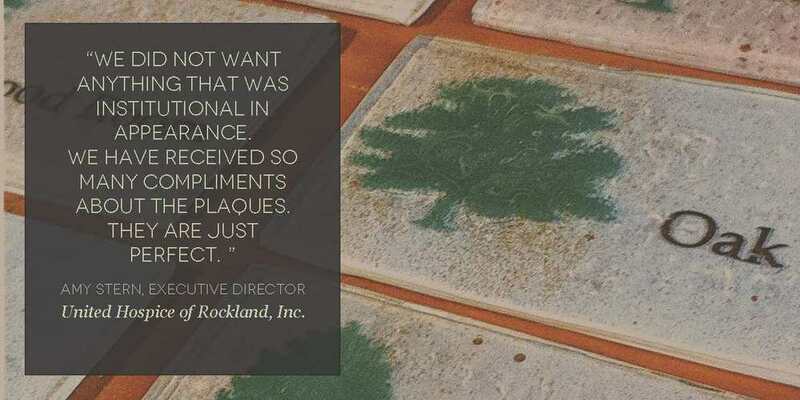 Hospice of the Piedmont (quote) - Donor Recognition Panel - Fused Glass. Donor Recognition Plaque - Fused and hand-painted glass with bronze and black ribbons on blue color palette. 'Faulkner Institute' - Donor Recognition Wall - Fused and hand-painted glass (full view). 'Faulkner Institute' - Donor Recognition Wall - Fused and hand-painted glass (detail). Whatcom Hopsice - Donor Recognition Plaque - Fused and hand-painted glass in evergreen color palette. Hospice of the Panhandle - Donor Recognition Panels - Fused and Hand-Painted Glass. Hospice of the Piedmont (detail) - Donor Recognition Panel - Fused Glass. Rockland Hospice - Donor Recognition Plaque - Fused and hand-painted glass. Davidson County Hospice - Donor Recognition Wall - Fused and hand-painted glass. Hospice of the Panhandle (detail) - Donor Recognition Panel - Fused and hand-painted glass. 'Faulkner Institute' - Donor Recognition Wall - Fused and hand-painted glass (detail view). 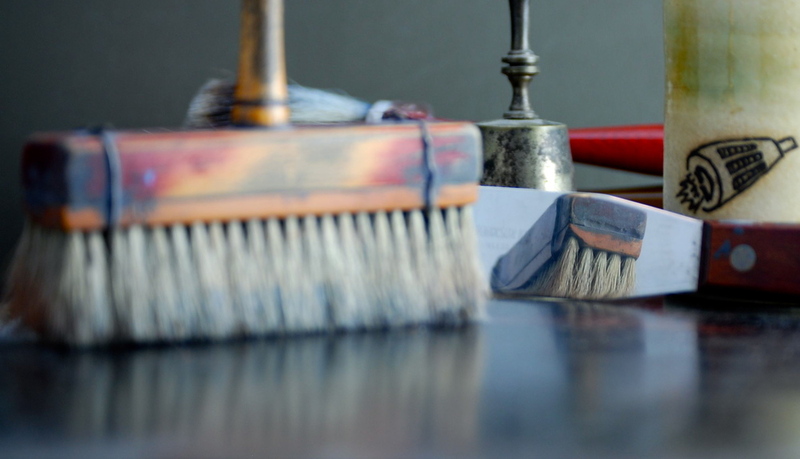 Studio workspace showing paint brushes and palette knife. Donor Recognition Plaque - Fused and hand-painted glass with gold mountains and a blue color palette. Donor Recognition Plaque - Fused and hand-painted glass 'La Mer' sand and sea color palette (full view). Donor Recognition Plaque - Fused and hand-painted glass 'Birds on a Wire' - Gold, bronze and red color palette. Donor Recognition Plaque - Fused and hand-painted glass 'Gold Leaf' - Gold and bronze color palette. Donor Recognition Plaque - Fused and hand-painted glass 'Birds on a Wire' - Gold, bronze and red color palette (full view). Donor Recognition Plaque - Fused and hand-painted glass with bronze and black ribbons on blue color palette (full view). 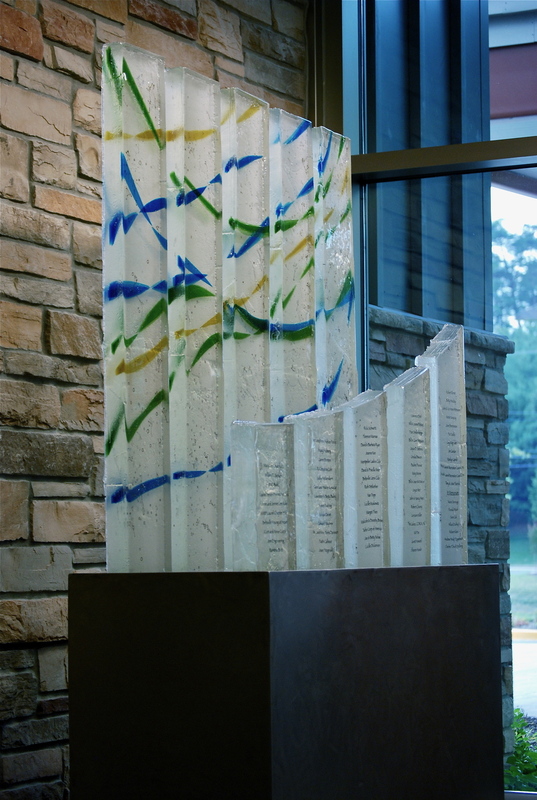 Beltsville-Laurel - Donor Recognition Sculpture - Fused glass columns with a custom made steel base - 7' high x 6' wide (side detail). Donor Recognition Plaque - Fused and hand-painted glass 'Gold Leaf' - Gold and bronze color palette (full view). Donor Recognition Panel - Fused and hand-painted glass with bronze and blue color palette. Beltsville-Laurel - Donor Recognition Sculpture - Fused glass columns (in the kiln). 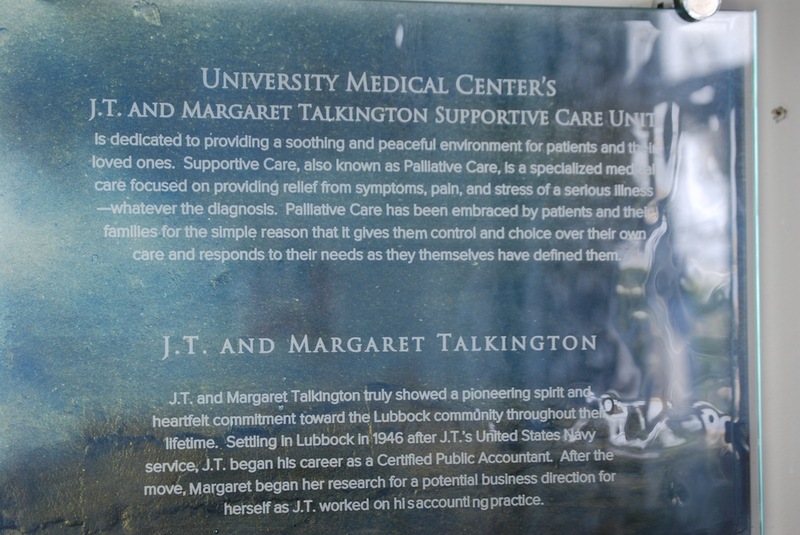 University Medical Center - Donor Recognition Panel - Fused and hand-painted glass (detail). Donor Recognition Plaque - Fused and hand-painted glass 'Ivy' - Gold and bronze color palette. Clear glass sign with white painted text and stainless steel hardware.